The AW18 season is well underway, we can all definitely feel it and our trends have changed with it. So what is actually in “style” this season you ask? Most importantly how can we reuse our AW17 wardrobe for this season’s fashion? This mini guide will guide you through what to buy for men / woman this autumn/winter. You may have noticed one of the biggest trends of AW17 outerwear was shearling the style of suede and wool combined in one garment. Yes, you guessed it, it’s back again this year with the likes of Giorgio Armani mixing up the textures further with a shearling, suede and leather jacket that looks smart yet cosy for the colder months. If you want to dig deeper than last year’s AW clothing with one of this season’s trends. That’s because this year it’s all about throwing it back to the ’90s, I am sure we all remember the 90s very well! You might’ve thought you’d seen the back of shell suits and full tracksuits, but they’re back with a vengeance. On the catwalk, Prada completed the look with branded bucket hats and lightweight waterproof jackets (ideal for autumn weather). We all have a leather jacket right, yes it’s back again for this season. However, instead of the shorter bomber style though, this season it’s all about oversized leather coats that can be paired with slim-leg jeans and winter boots. Fendi, Balenciaga and Paul Smith were all rocking the look during their AW18 shows this season. A favourite colour this season is the autumnal brown, a colour we all probably have in our wardrobe. From brown men’s suits to oversized ponchos and shiny leather jackets, the brown colour palette is so versatile. If you don’t want to overdo this shade, you can keep it simple with brown accessories such as hats, scarves and shoes to get in with the trend. We all love layering and know it keeps you very warm indeed. It’s all about bringing together different garments in an effortlessly stylish sort of way. You might not have worn a V-neck in a few years but bring it out this year and slip it on top of a roll-neck jumper for an on-trend outfit. Other ways to layer include pairing an open checked shirt with a casual suit jacket (a print that was everywhere in AW17) with a graphic t-shirt and black skinny jeans. Very similar to the menswear trends, layering is on-trend this AW18 too, with the top designers such as Balenciaga showing their support of the fashion technique at their shows. You may want to layer with contrasting colour and textures. Don’t forget to dig out you metallic puffa jacket from last year and wear it over a fringed jumper. 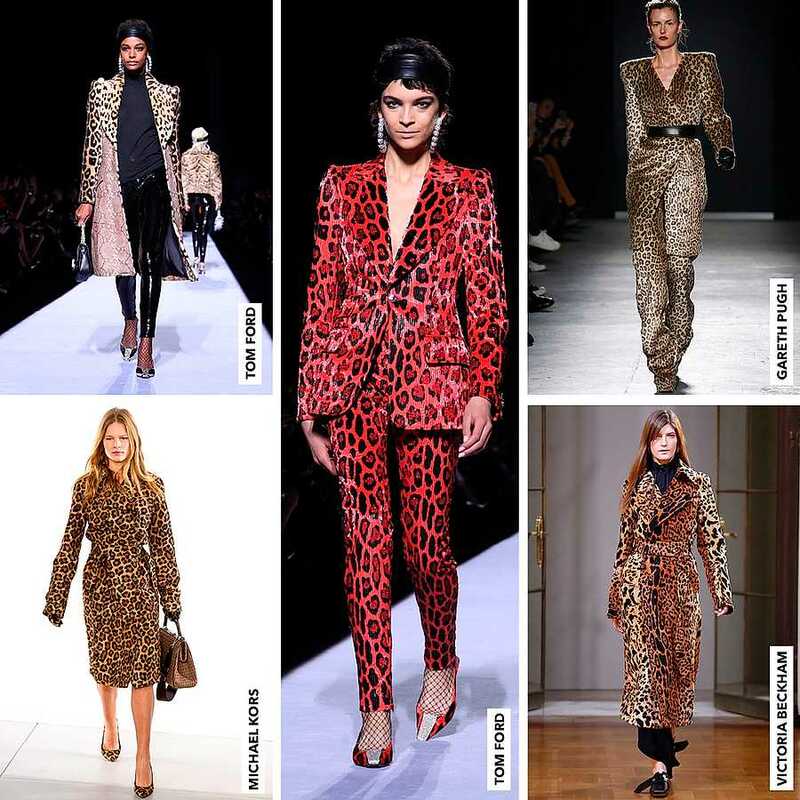 Animal print is also popular season after season, with the likes of Victoria Beckham demonstrating her love for leopard print, other designers such as Isabel Marant were all about snake patterns. The great thing about this style being in trend is that you can mix and match animal print and still create an outfit that looks well put together. Leopard print has rarely been out of the spotlight in recent years why not pair your printed cami dress with snakeskin boots and a matching clutch? The glitz and glam is always reserved for Christmas and New Year events otherwise it might be a little too much for some, this season they’re acceptable throughout autumn and winter. Paco Rabanne showed off their models in oversized silver sequins that brought some much-loved sparkle to the runway. You don’t need to wait until late December to bring your glitter dresses out of the wardrobe, embrace them in October and November too! This is one of my favourites, oversized and chunky knit is back for the colder seasons too. The great thing about this year’s trends though, is that you can pair your grandad knit with your summer dress and still look on-trend. Miu Miu showed off an outfit that was made up of a green floral midi dress and fluffy grey knit no need to pack away your summer clothes just yet!